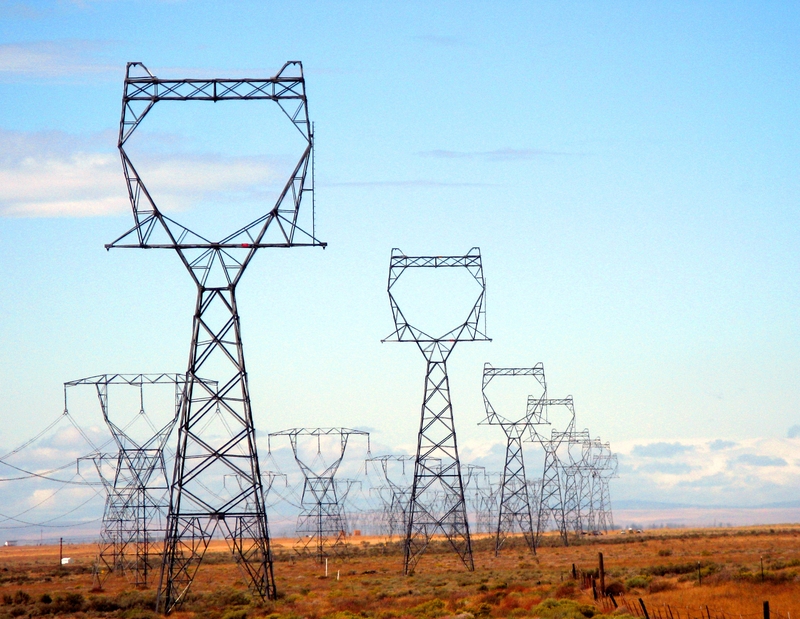 The first 10 miles of the McNary - John Day Transmission Line, Highway 14, Washington state. Transmission power lines typically have high voltages, up to 750,000 volts, but relatively low currents, up to 1000 amperes. The ampere (A), the SI base unit of electric current, is a familiar and indispensable quantity in everyday life. It is used to specify the flow of electricity in hair dryers (15 amps for an 1,800-watt model), extension cords (typically 1 to 20 amps), home circuit breakers (15 to 20 amps for a single line), arc welding (up to around 200 amps) and more. In daily life, we experience a wide range of current: A 60-watt equivalent LED lamp draws a small fraction of an amp; a lightning bolt can carry 100,000 amps or more. 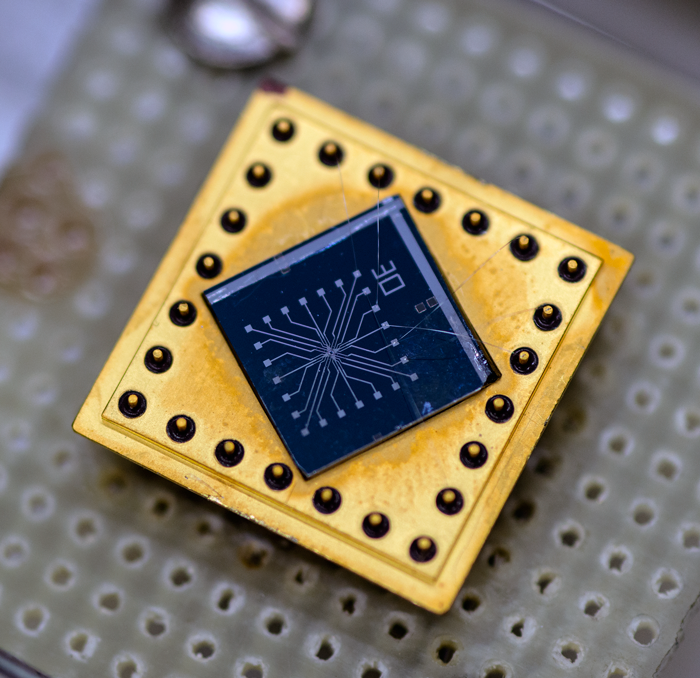 A 468-pixel cryogenic LED mapper for superconducting photon detectors. LEDs are very energy efficient; currents for a small LED can be just a few thousandths of an amp. The ampere has been an internationally recognized unit since 1908, and has been measured with progressively better accuracy over time, most recently to a few parts in ten million. The ampere is that constant current which, if maintained in two straight parallel conductors of infinite length, of negligible circular cross-section, and placed 1 meter apart in vacuum, would produce between these conductors a force equal to 2 x 10-7 newton per meter of length. Because infinitely long wires and vacuum chambers are generally unavailable, the ampere cannot be physically realized according to its own definition, though it can, with considerable difficulty, be approximated in a laboratory. Equally unsatisfactory is the fact that the amp, though an electrical quantity, is defined in mechanical terms. The newton (SI unit of force, kg•m/s2) is presently derived from the SI unit of mass: the kilogram stored in Sèvres, France. Its mass value drifts over time and thus limits the accuracy of its derived units. A 2013 thunderstorm in Santa Fe. 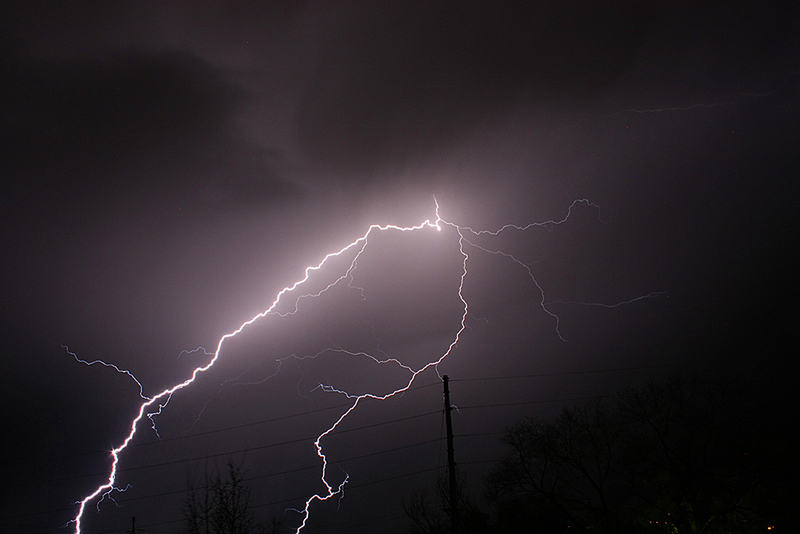 Typical lightning bolts can carry 100,000 amps or more of electric current. In November 2018, however, the redefinition of the ampere ― along with three other SI base units: the kilogram (mass), kelvin (temperature) and mole (amount of substance) ― was approved. Starting on May 20, 2019, the ampere will be based on a fundamental physical constant: the elementary charge (e), which is the amount of electric charge in a single electron (negative) or proton (positive). The ampere is a measure of the amount of electric charge in motion per unit time ― that is, electric current. But the quantity of electric charge by itself, whether in motion or not, is expressed by another SI unit, the coulomb (C). One coulomb is equal to about 6.241 x 1018 electric charges (e). One ampere is the current in which one coulomb of charge travels across a given point in 1 second. That’s why an average lightning bolt carries around 5 coulombs of charge, even though its current may be tens of thousands of amps. The difference in those numbers arises from the fact that a lightning strike only lasts a matter of a few tens of milliseconds (thousandths of a second). Defining the ampere solely in terms of the elementary charge e can be viewed as a sort of good news-bad news outcome. On the one hand, it defines the amp clearly in terms of only one invariant of nature that will be given an exact fixed value at the time of redefinition. After that occurs, direct measurements of the ampere will become a matter of counting the transit of individual electrons in a device over time. On the other hand, e is almost unimaginably small ― about a tenth of a billionth of a billionth of the amount of charge in a current of 1 ampere that moves past a given point in 1 second. Measuring individual electrons past a point is technically demanding, and a major challenge for scientists will be to produce a current of individual electrons that can be routinely measured and used as a standard. So, although the new definition will finally put the ampere on a more rational footing, it poses new and formidable challenges for measurement science.